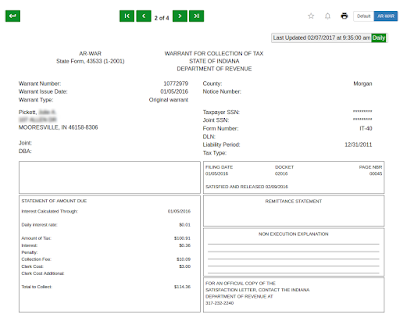 By default, our new tax warrant search is using a new name search system that behaves a little differently that you may expect. This change has many advantages, mainly that it now locates parties entered as part of an estate or other unusual situations. You no longer need to enter last name first, though it is still fine to do this. The new search will locate matching names no matter where they are in the party string. For example, "Pickett, Julie" and "Julie Pickett" will return the same results. This also means that "Julie Pickett" will return results such as "The Heirs and Interested Parties in the Estate of Julie Pickett" or "Prisoner number 9876543 Julie Pickett" or even "AKA Julie Pickett" without additional searches on your part. If you are used to entering partial names and a wildcard, this will be a change for you. Because the system is currently looking for alternate spellings and nicknames for your search, you'll need to go ahead and enter all the information you have about the name. For example, "Julie Pickett" and "Pickett, Ju%" are not the same. In this example, we have looked for alternatives, nicknames, and various spellings of the derivations of "Julie"
Please contact us with any questions or concerns about name searching! We're excited to announce a new search that covers Tax Warrant data for the entire state of Indiana! Over the last several months, we've been working to combine InCite data with other Tax Warrants available around the state, along with a number of search improvements that will make filtering through results much simpler and faster. This addition to our services is already included in your subscription, as we believe strongly in continually adding value for our subscribers. As always, our support is free and ready to assist should you have questions or comments about the new service. Regardless of your subscription level, searches may be used in any area of our system whether that be Court Cases, Recorded Documents, or Tax Warrants. This new service adds significant value for anyone preparing to issue credit, provide insurance, or verify a lien status. Tax Warrants in the State of Indiana may be issued for individual income, sales tax, withholding or corporation liability. These liens are filed in the County Clerk's Office and also forwarded to the County Sheriff. 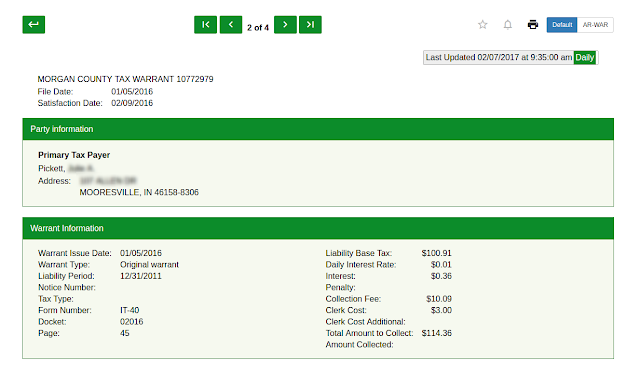 For more information on how Tax Warrants are issued, the state website provides some guidance: Indiana Department of Revenue Stages of Collection. Additionally, they provide information on How to Resolve a Tax Warrant once it has been issued. Note that the Tax Warrant information currently available through the court search will still be available for two weeks as we transition users to the more complete, state-wide Tax Warrant search. Look for a more detailed announcement about this coming up. And now for a sneak peak at the service! You'll notice a new area of the site for searching Tax Warrants, along with a new data tab. There are several advanced search options to allow searching by tax type, date, status, amount, name, address, county and more, in any combination. As always, once you have built a search that fits your needs, you can save that search and be alerted to updates on the results. Our search results look a little different, with several new features. Each column in your search results can be sorted, as well as moved. You can click on a column header and drag it to the left or right to group together the columns you find most important. Other new features include an additional filter that allows you to quickly locate items in the result set. As usual, you can save or set email alerts on any warrant. To do this, click on the star or bell icons for the row for that warrant. Clicking on the Warrant Number will take you to the complete set of details for that warrant. At the top of the details page, you'll notice a back arrow that will return you to the results page, as well as arrows to the left and right. These will walk you through each warrant in your result set, in case you don't want to click back and forth between the results and each warrant detail page. Also at the top is an option to view the information in the AR-WAR format that you may be more used to. Please explore these features and let us know what you think! If you have any questions about the service or need help, please contact our support team at 866-369-7671 or support@doxpop.com.